I would stare at that violin, a gift from my late grandfather, just sitting in our home, asking to be played. I kept thinking, “Someday I’ll learn…” When I retired, I picked it up – but then the shaking started. My name is Cam Brown. Born and raised in Alberta, I’ve been a music lover my whole life. But my diagnosis with Parkinson’s Disease in 2011 changed everything. I knew something was wrong when my arm started to seize and my right hand started to tremble. It looked as though my dream of learning to play the violin would never come true. But I wasn’t giving up without a fight. I’ve done physical therapy, tried different medications and two years ago I even underwent surgery for deep brain stimulation – anything to help keep the disease from progressing. A probe on the left side of my brain now controls the shaking I used to have on the right side of my body. With half of my body steady, I began to think about that violin again – with hope. 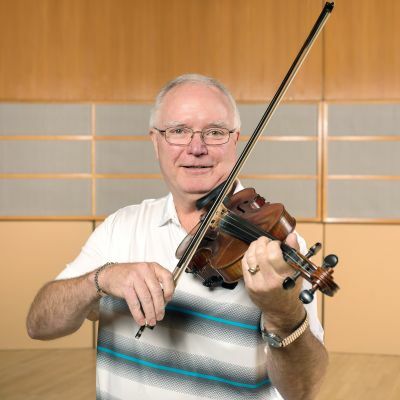 I signed up for a pilot program “Jam Session” offered by the Winspear Centre that paired Edmonton Symphony Orchestra musicians with Parkinson’s patients. My mentor was Aiyana Anderson-Howatt, a wonderful musician and beautiful person, both inside and out. She understood the way my muscles moved, or didn’t move, and was incredibly patient with me! There were six of us involved in that first Jam Session. I will never forget the look on each other’s faces when we played a piece of music, and it sounded good! Music has a beautiful structure to it. You must be in tune, you have to remain at a steady beat, and if you’re playing with someone else, you must play together. That structure has been an excellent remedy. It taught me to be louder and more confident. This disease makes you feel smaller and smaller, but music helps. Learning how to play music is opening up the world to me again. I don’t think I would be playing the violin right now if I hadn’t gone to that Jam Session put on by the ESO. After the program wrapped up, I started taking private lessons from Aiyana, and I’ve kept up with them, continuing to challenge myself with new repertoire. But I’m not the first person to benefit from the innovative programming offered through the ESO. The Tommy Banks Centre for Musical Creativity is constantly looking to offer musical discovery for people of all ages and backgrounds, whether through the YONA-Sistema program teaching underserved youth orchestral music, to parents and babies enjoying an immersive music class together. Please consider making a donation to support your ESO and these innovative programs. You never know who you may be helping. It was because of people like you that my dream came true.